A couple weeks ago I posted a request for Numenera players on the G+ Cypher System One-Shot Connection. It had been quite some time since my last one-shot, and I wanted to keep the good vibes flowing in our new group. I quickly gained a bunch of participants, but felt confident that by game time I'd be prepared with an adventure, perhaps something out of the Cypher Caster or Weird Discoveries. The days ticked by, one by one, and I kind of forgot to prepare something. I thought to myself, "maybe I'll just wing it on Friday." 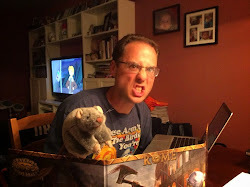 Even though the Weird Discovery adventures are a piece of cake to cobble together, I always have an easier time running my own Numenera adventures. Plus, I had my Numenera Cypher Chest and Rory's Story Cubes to help me flesh out any details. Use the Millennial Fair from Chrono Trigger as a theme. Wooden pirates (either made of wood or stealing wood) interested in the Westwood of Navarene. The fair should include lots of gross out moments. Feature the Iron Wind as the antagonist. The most important part of this was the Iron Wind. The haunting details of this terrible Ninth World scourge can be found on page 135 of the Numenera rulebook. The Iron Wind is a storm of rogue nano machines that painfully transforms everything it touches. Flesh becomes steel, stone becomes bone, new organisms sprout from old. I'm probably wrong, but to date I haven't read a Numenera adventure that featured the Iron Wind as the principle antagonist. Going into Friday I was confident that I could come up with something crazy completely on the fly, but I decided to expand on my notes and add a few more. I had a couple hours before game time, so why not make things look a little more professional for my players? I took those few sentences and began expanding into a full adventure outline. I'd like to present to you that outline! Back in January I posted a similar outline for my first draft of Metal Myk's Mercs, and it seemed fairly well received. Perhaps you can use this outline as a starting point for your own adventures! The Two Streams facility from the Doctor Who episode "The Girl Who Waited"
Sider (pronounced sid-ur) is a small village of about 1,000 located on the Cape of the Maw in the Sea Kingdom of Ghan. Although Navarene claims the Westwood, the people of Sider have mechanical devices of their own, and great “battery boats” that take them across Ryness Bay. These “lumber pirates” have outwitted Navarenes, the Emol family, and the Culova, to supply the City of Bridges with some of the finest wood available. But they have managed to keep the real treasures of the Westwood for themselves. The Siderian lumber pirates discovered that many of the trees in a particular grove of the Westwood have pieces of the numenera buried within the rings of the trees and contained within ancient amber. These caches contain some of those most incredible cyphers and artifacts ever to be found in the Ninth World. Every year the people of Sider hold a special spring festival to celebrate last year's “wooden raids" and boost excitement for the upcoming summer of lumber piracy. They call this the Gatherer's Festival. The people of Sider benefit from some terrific machines that have been left behind by a prior world, and so they are a people of tinkers and machinists. All Siderians have the equivalent of the "Fuses Flesh with Steel" focus, and are born with their mechanically augmented bodies. As Siderians grow up, they consume a diet high in metals that helps their bodies form proportionally. In previous years this celebration happened outside, but this year Mindus, elder of Sider, erected a grand dome containing hundreds of numenera enhanced Westwood saplings, and illuminated by ever glowing lights acquired on a previous raid. Entrance: A simple opening in the dome. On either side of the opening are a pair of greeters, one man and one woman on either side. The greeters offer water from metal chalices, and try to entice the player characters (PC's) to enter the Festival Dome. Tier One: The lower tier features all manners of games and entertainment. Yasmina the Fortune Teller: An older woman with a metal jaw tries to bring the PC's back to her tent. Once there she will tell them their fortunes. Yasmina sits on top of a rug woven from cord that helps draw a flow of information from the Datasphere to her tent. Use the Rory's Story Cubes to come up with each PC's fortune. Roll three dice and come up with a story. Go nuts! Tier Two: Lined with food stalls and single strange storefront, there are so many weird and somewhat off-putting smells coming from this level. Of course, native Siderians have no issues with the weird aromas. Sal's Salted Culova Eggs: PC's who have been to the Westwood and know the Culova as intelligent spiderfolk will be horrified to see the boiled eggs found here. Q's Cube Clams: Each of these tiny morsels is a small, square shell with a sweet clam bite inside. These Cube Clams can be found just off the coast in Ryness Bay. 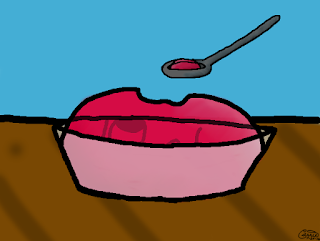 Thresher Jelly: A sweet, jiggly pudding that everyone at the Gatherer's Fair raves about. Feature Thresher Jelly whenever possible, with everyone eating the tasty goodness. The stand itself is certainly bizarre, as the jelly comes from a large grey box with a single spigot. On top of the box, the head of an ashen faced man is sticking out. His name is Thresher. 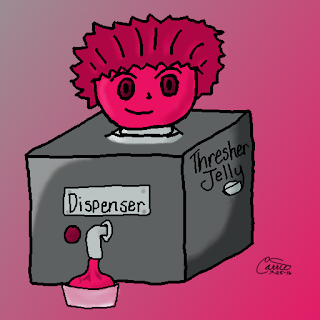 Every time Ganto (the Thresher Jelly seller) turns the spigot dispensing the jelly, Thresher groans in agony. The Gland Shoppe: To the east of Tier Two is Esterra and her gland manipulation parlor. For the cost of a single oddity, Esterra can implant either a Chemical Factory or Skill Boost cypher in the form of a brand new gland into a PC. This gland does not count against the PC's cypher limit, but the alien nature of the gland costs the PC 1 point of Might for each day that it's in their body. If asked, the glands are procured from a living plant-person that is kept chained up in the back of the tent. If freed, their name is Aldus, and they would very much like to get back to the Westwood and their family. Aeon Priests: A pair of Aeon Priests, Kumo and Steeev, are in the center of Tier Two examining the pieces of numenera covering the grounds, walls, and trees all around the Festival Dome. They both seem very concerned about the concentration of numenera, and that no good could come of this much technology in one single place. Tier Three: The highest part of the Festival Dome has a center stage area where a pair of machines are covered. To the east is a raised platform where a speaker will obviously stand. To the west is a training area where a large automaton stands. Romm & Kishta: Sider's greatest lumber raiders and numenera hunters, this father (Romm) and daughter (Kishta) team are the main attraction of the Gatherer's Festival. Elder Mindus cannot wait for them to unveil their finest discovery from the depths of the Westwood. Romm is dressed in a foppish, almost Las Vegas style Elvis impersonator outfit. He has metal legs. Kishta is wearing a practical leather vest that covers her one flesh arm but not her metal arm. Despite being only 25 her face is covered in scars and old battle wounds. Milo the Automaton: A great, 10' tall metal humanoid stands in the center of a small practice field. This is Milo, an amazing machine that Kishta found in the Westwood sitting next to a tree. Kishta believe Milo to be a prior world's lumber felling bot, but now just use him for combat practice and for lifting heavy objects. Every time Milo is struck by a metal object, the sound is deafening, requiring everyone in an immediate distance to make a difficulty 5 Intellect Defense Roll or be stunned for a single round. When first encountered, Milo is in "Combat Mode" and its fists are locked in a closed position. A special tool (carried by Kishta) is required to set Milo's fists into a grasping position (for carrying stuff). This can also be done with a difficulty 5 repair/mechanical check. Milo is practicing with a pair of Siderian children (level 2) who paid for the opportunity to face off against the machine. Milo won't harm the children beyond giving them a few lumps. For the price of 2 shins the PC's can try their hand at besting Milo. At 0 health the automaton shuts down, but is not destroyed unless the PC's try to inflict another 10 points of damage against the machine. The Stage: Romm can be found preparing for the big unveiling of the Teleportation Discovery. Of course, he will not tell anyone the details about the discovery. The Teleportation Discovery appears to be a pair of metal platforms, each with four plastic rods that rise 8' from the bases. There is a curtain behind the metal platforms, and peering behind reveals what looks to be an exercise bicycle and all kinds of Ninth World technology connected to the discovery. Obviously Romm has done quite a bit of jury rigging. Point of clarification: the Teleportation Discovery is not a teleportation device. It's actually a single Time Machine that has been split in two. The device itself is Level 7, and any kind of scanning or study will reveal that the two pads just need to be placed one over top of the other, creating a cage at the center with the combined eight rods locking in place. Once locked, grasping the correct series of rods will create a blue aura to surround the machine, and send it forward in time at 14 hours per second. The Time Machine Discovery only has enough power left to move forward for five minutes (30 days per minute, so 150 total days). After that it will shut down. If the PC's could read an ancient language that is incribed on the bottom of the easter panel, it would say "DO NOT attempt to use this Time Machine as a Teleportation Device. Doing so will attract rogue nano bots." Okay, that's not entirely true, but it's pretty much where this adventure is going. When the PC's arrive in Sider describe an amazing village of old metal buildings and tubes sticking straight into the sky, encircled by a functioning but rickety moving sidewalk. Sider is a place where ancient technologies are restored, celebrated, worshipped, and adored. Let the PC's explore the Festival Dome and the Gatherer's Festival, taking part in the games, revelry, and entertainment. If the players seem reluctant to let their hair down, have an NPC show up and try to engage them. After enjoying the fun for some time, Mindus the Elder will make an announcement from the platform on Tier Three that the great explorers and numenera hunters Romm and Kishta will be unveiling their great discovery. Mindus will call for everyone to Tier Three where there are several rows of chairs and a lot of standing room. Adorned in all his finery, Romm will tell the audience that he and his daughter discovered an incredible device that will allow Siderians to travel to and from the Westwood without their expensive battery boats. Pulling back the curtains, he reveals a pair of metal platforms and asks for a volunteer. If the volunteer is a PC, this is a fantastic time for a GM Intrusion. Hopefully you've thrown a few in at this point. Since the Teleportation Discovery is actually a Time Machine Discovery, engaging the devices improperly causes a major malfunction. One of the PC's cyphers, determined at random, is set off, causing its effect immediately. On top of the cypher going off, the Iron Wind shows up, drawn by corrupted machine interfacing with the datasphere surrounding Sider. Perhaps the Aeon Priests were right, and they should've have collected all this numenera in one place! The rest of the adventure should involve the PC's trying to survive the Iron Wind as it destroys the village, the Siderians, and the Festival Dome. The ultimate destroyer of the Ninth World, treat any interaction with the Iron Wind as a level 7 difficulty. This may seem impossible to deal with, but careful use of skills, equipment assets, terrain, and NPC's will help their chances. If there was ever a time to use effort, now is the time. The Iron Wind will start killing people outside of the Festival Dome. Siderians begin rushing into the dome screaming with terrible transformations perverting their bodies. Go crazy with the descriptions. Flesh becomes stone, mollusks emerge from villagers' faces pushing out their eyes, children become full grown aneen. Depending on your players, go graphic with the details. Double down on describing risks of leaving the Festival Dome on foot. As the PC's come up with creative ways to get away from the Iron Wind, create tears in the dome itself, with terrible creatures bent on destruction erupting from the walls. I re-skinned Blood Barms (Numenera, page 232) and Sathosh (Numenera, page 257) as warped humans. Well equipped PC's may have cyphers or artifacts that will transport them away from Sider, so encourage these devices to be used. But if not, there is one more way to salvation: The Time Machine! Scanning or using mechanical knowledge on the Teleportation/Time Machine Discovery will reveal that the two pieces need to be placed back together. Since each is quite heavy, they can be manipulated through a level 6 difficulty might-based lifting test, or other engineering genius. Once one is placed on top of the other, up to eight PC's/NPC's can hide inside and move themselves forward through time. Doing so protects the time travelers from the effects of the Iron Wind. So long as they move forward three full days, they will be clear of the Iron Wind's effects. Make sure to describe, in your own special way, the horrors that befall Sider. Make it crazy! Eventually the Iron Wind will eat through the entire dome shell, causing it to fall down in puddles of grey ooze. Hopefully by this point the player characters have done something to fix their situation. If not, go for the TPK (total party kill.) Their next characters will be much more careful. Give the PC's 2 XP for surviving the adventure, and another 2 XP if they find a way to use the Time Machine Discovery as their means of escaping a horrifying death. There were a ton of creative solutions to the challenges facing the group. Sam role played Voren as hating Aeon Priests, so he used a cypher to teleport himself to Kishta's automaton directly from Tier One. I offered a GM Intrusion to have Voren appear directly on Milo's shoulders. This interaction created an easy connection between the PC's, Romm, and Kishta. Grants the user the Scan esotery, but with a modified Immediate range. The sprayer must be six inches away from what is being scanned. To escape the Iron Wind, the PC's scanned the Time Machine Discovery, figured out its use, and then talked Kishta into using Milo to lift the two pieces together. Kishta had been busy caring for her father, whose arm was terribly injured. During the demonstration of the device, the volunteer (Tes) had a cell disrupting cypher that exploded! I almost forgot to add, that when Voren got hit by some Iron Wind, I dipped into my crazy archive of memories and brought out Kuato! Remember that mutant from Total Recall? Voren felt a humanoid shape appear in his belly, which he immediately carved off. Poor guy! We had a great time last night, and hopefully some of you readers may find this adventure worthy of placing in your own games. If you do happen to use this adventure, or even a part of it, please let me know!